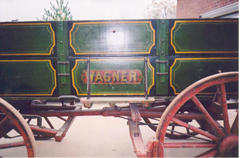 This original Wagner wagon was made in Jasper, Indiana. G.P. 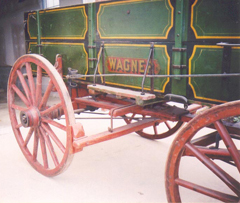 Wagner began his wagon-making career as a blacksmith in the early 1880’s and the company eventually grew to become a well-known local and regional wagon builder. 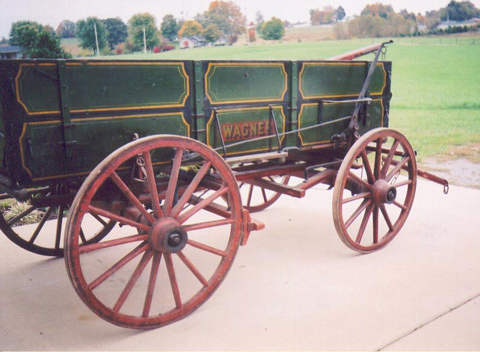 As evidenced by the fit, finish, detailed woodwork and heavier metalwork on this wagon, Wagner placed a great deal of pride in their vehicles. 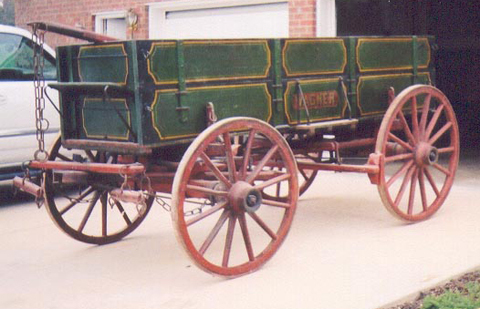 The brand name on the side of the box was created from a decal-like transfer that was applied to the wagon. Once secured, these vintage types of logos bonded so tightly that they are sometimes confused with those that have been painted on. 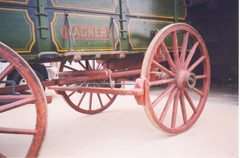 While minor compared to most surviving vehicles, this wide-track wagon has suffered some loss of pin striping and paint on the wheels. It retains all of its logo signage, a factory painted serial number and the original brake, footboard, stiff tongue, doubletree, and singletrees.